Tonbridge School is an independent day and boarding school for boys in Tonbridge, Kent, England, The school is one of the leading boys' boarding schools in the country and highly respected internationally. The school aims to provide a caring and enlightened environment in which the talents of each individual flourish. In the summer of 2016 they redeveloped their library. The School wanted to create a new, inspirational space offering a variety of flexible and adaptable teaching and learning environments, bringing together in one home, the services which their students need to thrive, including Learning Support, and the Universities and Careers service. 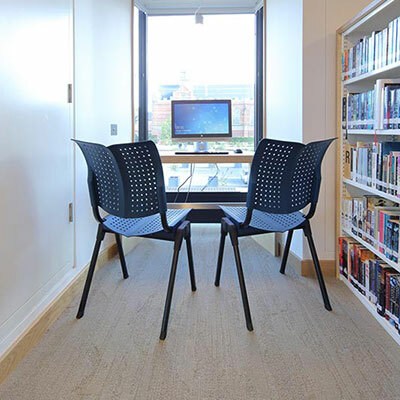 As part of a conscious effort to invest in the library a more professional style of furniture, they chose the HÅG Conventio Wing as the main chair in the library. The ability of the chair to stay balanced and level with the ground was a key factor in the decision, as was the general comfort that the chair provided in both upright and reclined positions. It’s flexibility of use meant it was both practical and comfortable for students making short visits to the library or for longer study sessions. Utilising the customisation options available, the school chose colours they felt would be ‘calm’, in what is a calm, yet purposeful space. They used fabric on those chairs which were positioned in the private study areas, and would therefore receive use over a more sustained period of time. The fact the chairs gave the impression of looking like an ‘open book’ from certain angles was also very appealing in a library building.